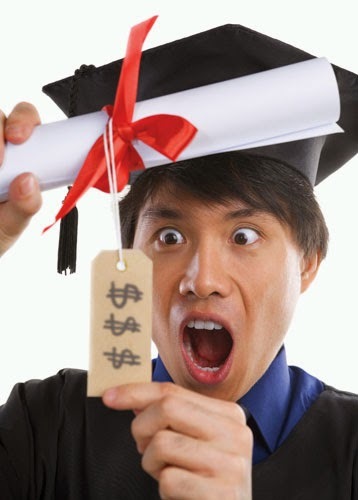 Path to Scholarships®: Don't Be Another Statistic with Student Loan Debt! Don't Be Another Statistic with Student Loan Debt! According to Susannah Snider, an education reporter at U.S. News, Americans have borrowed and accrued over $1.2 trillion in outstanding federal student debt based on information from the Consumer Financial Protection Bureau. What does $1.2 trillion look like? $1,200,000,000,000.00 That is a huge amount of outstanding, un-repaid loan debt! It surpasses the national credit card debt, at $8.7 billion as seen as the National Debt Clock. The National Association of Colleges and Employers validates that the average salary of the class of 2013 was $45,327. How can students hope to escape the loan burden with the average salary? Based on an annual U.S. News survey, currently, only 41 percent of students graduate in four years, so the interest continues to increase as does the loan amount taken. The three-year student loan default rate is approximately 15 percent for recent graduates, meaning they defaulted within the first three years of attempting to repay their loan. This default cripples a person's credit score and the opportunities to purchase cars and homes. The government may decide to seize your tax refund or wages in an attempt to be repaid. Truly scary is that borrowers older than sixty years of age, comprised of parents who cosigned and older students, owe $43 billion in student loan debt. Say goodbye to social security benefits as they are garnished to pay off the outstanding student loan and filing bankruptcy is not an option. As the economy continues to struggle, Alan Pyke of ThinkProgress states that half a million more Americans are in default on their student loans than just a year ago, according to the Department of Education. Do not allow yourself to become another loan debt statistic! Path to Scholarships® is the solution! Services gave by custom essay writing service propel supporting and interfacing towards your necessities in fulfilling your custom essay and distinctive sorts of academic writing. Such breaking point enables us to interface these capacities together and help formally develop the advancement and change that you require while writing essays. Every modernteacher can tell you that student loans won't make you any good. Think about it carefully before applying to the university. Administration of every nation is to a great degree plenteous sharp and making some genuine endeavors to help the training arrangement of nation that winds up in a serene and society loaded with tranquility and visit http://www.cheapproofreading.net/our-cheap-proofreading-services/best-cheap-editing-service/ website to get more helpful info about topic to manage work. keep it up! The free site for the free online tech blog is https://www.onlinetechblogs.com/ for the free.